I am aiming for books that are going to be engrossing and keep my attention. They don’t have to be light, but I don’t want anything that’s a chore to get through. Hopefully this list will hit the mark. I went to the new Amazon Bookstore in downtown Bethesda, MD over the weekend. My impressions: it’s a fun place to browse, but it’s not a full-service bookstore. The inventory is too spare. According to this article in the Washington Business Journal, “Every book in the store is either a best-seller, new release or has an online rating of at least four stars. Curators consider books based on Amazon customer ratings, pre-orders, sales and popularity on social cataloging site Goodreads in making selections. The curators will also determine what gets on the shelves by looking at Kindle reading behavior — Amazon is a data company, after all — to let customers know where to find the real page turners.” So it’s a good place to get recommendations and discover new books based on other books you’ve liked. But you’re not going to have much luck looking for a specific book that isn’t on the best-seller list. If you’re a Prime member, you pay Prime prices. My office will soon be moving to Bethesda, but I doubt this will be a regular lunchtime destination for me. 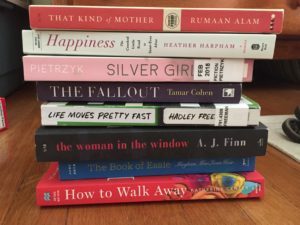 I have a winner from the June Is Audiobook Month giveaway! Congratulations to Pat Burke! OK, I’ll be back to review vacation reads, either from the trip or when I get back. Posted on July 3, 2018 by gayle. This entry was posted in General and tagged Amazon bookstore, vacation reads. Bookmark the permalink. Have a great time and I hope all your books fit!